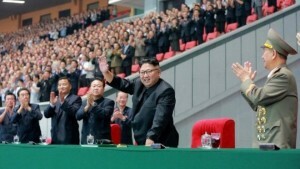 South Korean government officials have said that North Korea executed one of its highest ranking ministers last month. Seoul’s unification ministry said Kim Yong-jin was one of Pyongyang’s vice premiers and in charge of education. Officials did not explain how they got the information. Seoul’s record on reporting such developments is patchy. In May, a North Korean military chief said to have been executed was found to be alive and attending official events. Ri Yong-gil was widely reported to have been executed in February but when he made an appearance at North Korea’s party congress it highlighted just how difficult it is to get accurate information from the North. The unification ministry, the government department which manages relations with the North is, along with the spy agency, the South’s primary source of information about Pyongyang. The unification ministry also said a prominent minister responsible for intelligence and inter-Korean relations, Kim Yong-chol, had been sent for re-education along with another official, named as Choi Hwi, for a month in mid-July. North Korea itself very rarely provides confirmation of such reports. The last execution Pyongyang released official information about is thought to be the notorious purge of Kim Jong-un’s own uncle, Chang Song-thaek in 2013. The chief strategist of the Islamic State group, whose calls for attacks against the West during Ramadan led to mass bloodshed, has been killed in Syria, IS-affiliated media say. 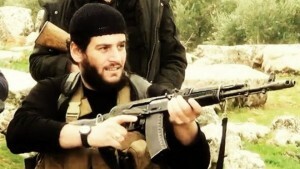 The Amaq news agency said Abu Muhammad al-Adnani died in Aleppo province. The Pentagon said an air strike had targeted Adnani in the town of al Bab and the results were being assessed. 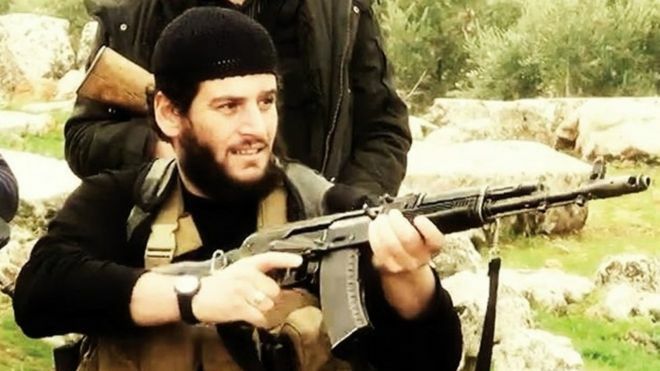 Adnani – who was also the group’s spokesman – was “martyred while surveying the operations to repel the military campaigns against Aleppo”, Amaq said, without giving details about how he died. Fighting has escalated around the city in recent weeks, with rebels breaking a siege by government forces and Syrian and Russian warplanes bombing rebel-held areas. China’s foreign ministry condemned the bombing as an “extreme and violent attack”. No-one has yet said they were behind the suicide bombing. Chinese foreign ministry spokeswoman Hua Chunying said: “China is appalled and strongly condemns the violent act.” She said China had “demanded that Kyrgyz authorities take all necessary measures to ensure the safety of Chinese institutions and personnel in Kyrgyzstan, launch a thorough investigation to find out the truth of the incident and harshly punish the perpetrators”. 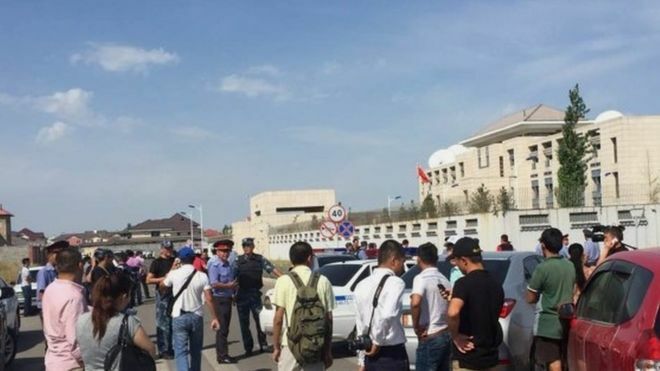 The vehicle reportedly smashed through the gates and exploded in the centre of the compound, close to the ambassador’s residence. Social media footage showed smoke billowing above the building. “As a result of the explosion, only the suicide bomber terrorist died,” Mr Razakov told journalists. Turkish forces have attacked what they say are Kurdish “terrorists” since crossing the border last week. 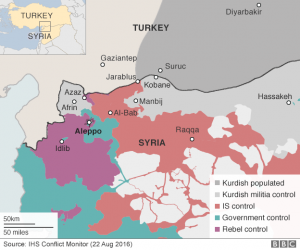 But the Kurdish YPG militia says Turkey just wants to occupy Syrian territory. US President Barack Obama will meet his Turkish counterpart Recep Tayyip Erdogan in China on Sunday, ahead of the G20 summit there, and will discuss Syria, the White House said. Ankara says it aims to push both IS and Kurdish fighters away from its border. Turkish forces and allied factions of the rebel Free Syrian Army (FSA) forced IS out of the Syrian border city of Jarablus on Wednesday and have since pounded neighbouring villages held by Kurdish-led, US-backed Syria Democratic Forces (SDF). The Turkish military had carried out 61 artillery strikes on 20 targets around Jarablus in 24 hours, Turkey’s state news agency Anadolu reported on Monday. Turkey has insisted Kurdish militia, which it regards as terrorists, retreat east across the Euphrates river. The Kurdish Popular Protection Units (YPG), which dominates the SDF, says its forces have withdrawn, and that the Turkish action against the group was a “pretext” for occupying Syria. The US Defence Secretary Ash Carter said the YPG “will and is withdrawing” east of the Euphrates. He called on Turkey to stay focused on the fight against IS and not to engage the SDF. He said the US was “very supportive” of Turkey’s general counter-IS activities and its efforts to secure the border – but not the area south of Jarablus. A British man who was injured trying to save a fellow backpacker as she was stabbed to death in Australia has died, Queensland Police has said. Thomas Jackson, 30, of Congleton, Cheshire, was injured when he tried to help Mia Ayliffe-Chung, 21, in the attack at a hostel last week. Frenchman Smail Ayad, 29, has been charged with murdering Ms Ayliffe-Chung and attempting to murder Mr Jackson. Police said this charge would be changed to murder. Mr Jackson’s father Les said: “We are bereft. Our darling Tom has left us and the world is a poorer place. “There is dark and evil in this world perpetrated by a few, but so much more love and light emanates from so many more. That thought will sustain us over the coming days.” The backpacker suffered critical head injuries as he went to the aid of Ms Ayliffe-Chung, from Wirksworth, Derbyshire. Police described his actions as “selfless”. 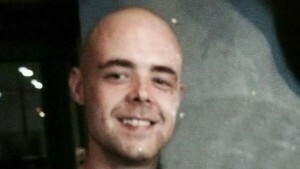 A spokesman for Queensland Police said Mr Jackson died in the Townsville Hospital. Investigations are continuing, but detectives will upgrade the charge to murder when Mr Ayad next appears at Townsville Magistrates’ Court on October 28, he added. Mr Ayad is alleged to have stabbed Ms Ayliffe-Chung and to have caused the injuries which led to Mr Jackson’s death at the Shelley’s Backpackers accommodation in Home Hill on 23 August, at about 23:15 local time. Twelve police officers were also injured.